خسروی, حامد, اسلامی فارسانی, رضا. (1395). بررسی تجربی تاثیر افزودن نانوذرات سیلیکای اصلاح شده سطحی بر رفتار مکانیکی پنل‌های مشبک کامپوزیتی اپوکسی- الیاف شیشه تحت بارگذاری عرضی. 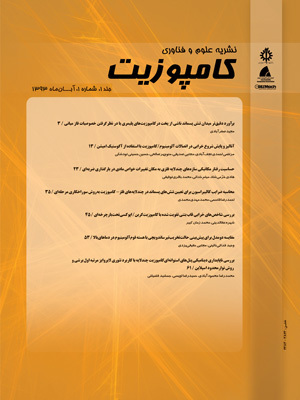 علوم و فناوری کامپوزیت, 3(1), 11-20. حامد خسروی; رضا اسلامی فارسانی. "بررسی تجربی تاثیر افزودن نانوذرات سیلیکای اصلاح شده سطحی بر رفتار مکانیکی پنل‌های مشبک کامپوزیتی اپوکسی- الیاف شیشه تحت بارگذاری عرضی". علوم و فناوری کامپوزیت, 3, 1, 1395, 11-20. خسروی, حامد, اسلامی فارسانی, رضا. (1395). 'بررسی تجربی تاثیر افزودن نانوذرات سیلیکای اصلاح شده سطحی بر رفتار مکانیکی پنل‌های مشبک کامپوزیتی اپوکسی- الیاف شیشه تحت بارگذاری عرضی', علوم و فناوری کامپوزیت, 3(1), pp. 11-20. خسروی, حامد, اسلامی فارسانی, رضا. بررسی تجربی تاثیر افزودن نانوذرات سیلیکای اصلاح شده سطحی بر رفتار مکانیکی پنل‌های مشبک کامپوزیتی اپوکسی- الیاف شیشه تحت بارگذاری عرضی. علوم و فناوری کامپوزیت, 1395; 3(1): 11-20. سازه‌های مشبک کامپوزیتی به‌علت دارابودن خواص منحصر به‌فرد همانند استحکام و مدول ویژه بالا، ظرفیت تحمل بار بسیار بالا و همچنین میزان جذب انرژی فوق‌العاده، کاربردهای گسترده‌ای در صنایع صنایع هوا و فضا و همچنین خودروسازی پیدا کرده‌اند. این سازه‌ها در حین سرویس شرایط مختلف بارگذاری را تجربه می‌کنند. در تحقیق حاضر، پنل‌های مشبک کامپوزیتی با هندسه ایزوگرید و تقویت‌شده با نانوذرات سیلیکا تحت بارگذاری عرضی مطالعه شده‌اند. در گام اول، سطح نانوذرات سیلیکا به‌وسیله عامل کوپلینگ تری گلیسید اکسی پروپیل تری متوکسی سیلان (3-GPTS) اصلاح شد و در ادامه تاثیر افزودن درصدهای مختلف نانوسیلیکا در زمینه (صفر، 1، 3 و 5 درصد وزنی) بر رفتار خمش سه‌نقطه‌ای پنل‌های مشبک کامپوزیتی اپوکسی- الیاف شیشه نوع E مورد بررسی قرار گرفت. اصلاح سطحی نانوذرات سیلیکا و برهمکنش آن‌ها با عامل کوپلینگ 3-GPTS توسط طیف‌سنجی مادون قرمز تبدیل فوریه (FT-IR) مورد تأیید قرار گرفت. نتایج این تحقیق نشان داد که افزودن نانوذرات سیلیکای اصلاح سطحی‌شده رفتار خمش سه‌نقطه‌ای پنل‌های مشبک کامپوزیتی الیافی را تحت تأثیر قرار می‌دهد. بیشترین میزان بهبود در مقادیر بار حداکثر خمشی و جذب انرژی ویژه پنل‌ مشبک کامپوزیتی با افزودن 3 درصد وزنی نانوسیلیکای اصلاح سطحی شده به‌ترتیب با 14 درصد و 25 درصد افزایش مشاهده شد. همچنین در این کامپوزیت‌ها کسر قابل توجهی از جذب انرژی سازه بعد از نقطه حداکثر بار حاصل شد. علاوه بر این، سفتی سازه با افزودن نانوذرات سیلیکا افزایش یافت. در مجموع، تحقیق حاضر موید آن است که افزودن نانوذرات سیلیکای اصلاح سطحی‌شده به‌عنوان جزء سوم در سازه‌های مشبک کامپوزیتی می‌تواند به بهبود خواص مکانیکی آن‌ها تحت بارگذاری عرضی کمک شایانی کند. Grid-stiffened composite (GSC) structures have been maturely developed in aerospace, aircraft and automobile industries due to their attractive properties such as high specific strength and stiffness, superior load bearing capacity, and excellent energy absorption capability. These structures undergo various loading conditions in service. In the present study, iso-GSC structures reinforced with silica nanoparticles (SiO2) have been investigated in terms of their capability to improve the mechanical properties during transverse loading. At first, a silane coupling agent (3-glycidoxypropyltrimethoxysilane/3-GPTS) was introduced onto the silica nanoparticle surface and the effects of silica content (0, 1, 3, and 5 wt.% with respect to the matrix material) on the three-point flexural response of isogrid E-glass/epoxy composites were assessed. Based on the Fourier transform infrared (FT-IR) spectra, it was inferred that the 3-GPTS coupling agent was successfully grafted onto the surface of silica nanoparticles after modification. The results showed that nano-SiO2 particles incorporation affected the flexural properties of the isogrid fibrous composites. Maximum improvements in the flexural load and energy absorption were obtained after adding 3 wt.% nano-SiO2 particles. In this condition, up to 14% and 25% increase in the maximum flexural load and energy absorption, respectively were observed, compared to the sample without silica addition. In these structures, a considerable amount of energy absorption occurred beyond primary failure at the peak load point. Furthermore, the flexural stiffness was increased by increasing the silica loading. In conclusion, this study suggests that the addition of modified silica nanoparticles is a promising method to improve the flexural properties of the grid-stiffened fibrous composite structures. ASM Handbook, Composites, Metals Park, OH 44073: ASM Int. Vol. 21, 1997. Vasiliev, V. V. and Razin, A. F., “Anisogrid Composite Lattice Structures for Spacecraft and Aircraft Applications”, Composite Structures, Vol. 76, pp. 182-189, 2006. Vasiliev, V. V. Barynin, V. A. Rasin, A. F. Petrokovskii, S. A. and Khalimanovich, V. I., “Anisogrid Composite Lattice Structures-Development and Space Applications”, Composite structures, Vol. 3, pp. 38-50, 2009. Fan, H. Fang, D. and Jin, F., “Mechanical Properties of Lattice Grid Composites”, Acta Mechanica Sinica, Vol. 24, pp. 409-418, 2008. Hedayatian, M. Liaghat, G. H. Rahimi, G. H. and Pol, M. H., “Numerical and Experimental Analyses Projectile Penetration in Grid Cylindrical Composite Structures under High Velocity Impact”, In Persian, Modares Mechanical Engineering, Vol. 14, No. 9, pp. 17-26, 2014. Wodesenbe, E. Kidane, S. and Pang, S. S., “Optimization for buckling loads of grid stiffened composite panels”, Composite Structures, Vol. 60, pp. 159-169, 2003. Totaro, G., “Local Buckling Modelling of Isogrid and Anisogrid Lattice Cylindrical Shells with Triangular Cells”, Composite Structures, Vol. 94, pp. 446–452, 2012. Gibson, F. R., “Energy Absorption in Composite Grid Structures”, Advanced Composite Materials, Vol. 14, pp. 113-119, 2005. Gan, C. Gibson, R. and Newaz, G., “Analytical/Experimental Investigation of Energy Absorption in Grid-Stiffened Composite Structures under Transverse Loading”, Experimental Mechanics, Vol. 44, No. 2, pp. 185-194, 2004. Jadhav, P. and Mantena, P. R., “Parametric Optimization of Grid-Stiffened Composite Panels for Maximizing Their Performance under Transverse Loading”, Composite Structures, Vol. 77, pp. 353-363, 2007. Kim, T. D., “Fabrication and Testing of Thin Composite Isogrid Stiffened Panel”, Composite Structures, Vol. 49, pp. 21-25, 2000. Akl, W. El-Sabbagh, A. and Baz, A., “Optimization of the Static and Dynamic Characteristics of Plates with Isogrid Stiffeners”, Finite Element in Analysis and Design, Vol. 44, pp. 513-523, 2008. Shokrieh, M. M. Saeedi, A. and Chitsazzadeh, M., “Evaluating the Effects of Multi-Walled Carbon Nanotubes on the Mechanical Properties of Chopped Strand Mat/Polyester Composites’, Materials and Design, Vol. 56, pp. 274-279, 2014. Jacob, S. Suma, K. K. Mendez, J. M. and George, K. E., “Reinforcing Effect of Nanosilica on Polypropylene-Nylon Fiber Composite”, Materials Science and Engineering B, Vol. 168, pp. 245-249, 2010. Mirzapour, A. Asadollahi, M. H. Baghshaei, S. and Akbari, M., “Effect of Nanosilica on the Microstructure, Thermal Properties and Bending Strength of Nanosilica Modified Carbon Fiber/Phenolic Nanocomposite”, Composites Part A, Vol. 63, pp. 159-167, 2014. Subramaniyan, A. K. and Sun, C. T., “Enhancing Compressive Strength of Unidirectional Polymeric Composites Using Nanoclay”, Composites Part A, Vol. 37, pp. 2257-2268, 2006. Gojny, F. H. Wichmann, M. H. G. Fiedler, B. Bauhofer, W. and Schulte, K., “Influence of Nano-Modification on the Mechanical and Electrical Properties of Conventional Fiber-Reinforced Composites”, Composites Part A, Vol. 36, pp. 1525-1535, 2005. Uddin, M. F. and Sun, C. T., “Strength of Unidirectional Glass/Epoxy Composite with Silica Nanoparticle-Enhanced Matrix”, Composite Science and Technology, Vol. 68, pp. 1637-1643, 2008. Zamani, R. Rahimi, G. H. Pol, M.H. and Hedayatian, M., “Reinforcing Effect of Nanoclay on Buckling Behavior of Nanocomposite Grid Shells: Experimental Investigation”, In Persian, Modares Mechanical Engineering, Vol. 15, pp. 411-418, 2015. Zamani, R. Rahimi, G. H. Pol, M. H. and Hedayatian, M., “Reinforcing Effect of Nanoclay on Buckling Behavior of Glass Fiber/Epoxy-Clay Cylindrical Grid Structures-Experimental Study”, The Bi-Annual International Conference on Experimental Solid Mechanics and Dynamics (X-Mech-2014); 2014, Tehran, Iran. Salon, M. C. B. and Belgacem, M. N., “Hydrolysis-Condensation Kinetics of Different Silane Coupling Agents”, Phosphorus, Sulfur, and Silicon, Vol. 186, pp. 240-254, 2011. YE, Y. Zeng, X. Qiangli, H. Chen, P. and Ye, C., “Synthesis and characterization of nanosilica/polyacrylate composite emulsions by sol-Gel Method and In-situ Emulsion Polymerization”, Journal of Macromolecular Science Part A, Vol. 48, pp. 42-46, 2011. Shukla, D. K. Kasisomayajula, S. V. and Parameswaran, V., “Epoxy Composites Using Functionalized Alumina Platelets as Reinforcements”, Composite Science and Technology, Vol. 68, pp. 3055-3063, 2008. Ma, J. Z. and Hu, J., “Polyacrylate/Silica Nanocomposite Materials Prepared by Sol-gel Process”, European Polymer Journal, Vol. 43, pp. 4169–4177, 2007. Sharma, S. C. Sheshadri, T. S. Krishna, M. Murthy, H. N. N. and Jose, J., “Influence of Solvents on the MWCNT/Adhesive Grade Epoxy Nanocomposites Preparation”, Journal of Reinforced Plastics and Composites, Vol. 28, No. 22, pp. 2805-2812, 2009. ASTM D7264/D7264M–07: Standard Test Method for Flexural Properties of Polymer Matrix Composite Materials. Kang, S. Hong, S. I. Choe, C. R. Park, M. Rim, S. and Kim, J., “Preparation and Characterization of Epoxy Composites Filled with Functionalized Nanosilica Particles Obtained Via Sol-Gel Process”, Polymer, Vol. 42, pp. 879-887, 2001. Wang, H. Bai, Y. Liu, S. Wu, J. and Wong, C. P., “Combined Effects of Silica Filler and Its Interface in Epoxy Resin”, Acta Materialia, Vol. 50, pp. 4369-4377, 2002. Srikanth, I. Daniel, A. Kumar, S. Padmavathi, N. Singh, V. Ghosal, Kumara P. A. and Devia, G. R., “Nanosilica Modified Carbon-Phenolic Composites for Enhanced Ablation Resistance”, Scripta Materialia, Vol. 63, pp. 200-203, 2010. Shariati, M. Farzi, G. and Dadrasi, A., “Mechanical Properties and Energy Absorption Capability of Thin-Walled Square Columns of Silica/Epoxy Nanocomposite”, Construction and Building Materials, Vol. 78, pp. 362-368, 2015. Eslami-Farsani, R. Khalili, S. M. R. Hedayatnasab, Z. and Soleimani, N., “Influence of Thermal Conditions on the Tensile Properties of Basalt Fiber Reinforced Polypropylene-Clay Nanocomposites”, Materials and Design, Vol. 53, pp. 540-549, 2014.